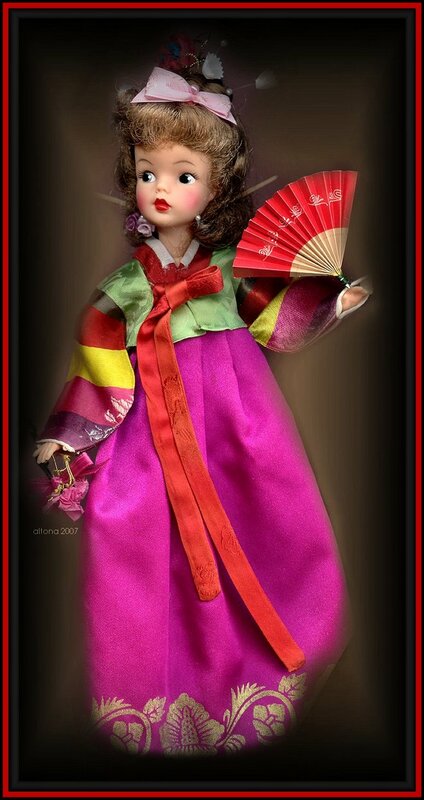 The hanbok is the traditional clothing of Korean ladies and often consists of a bow sleeved bolero or vest called a jeogori (chogori), worn over a large wrap under skirt called a chima. After doing some online research, I learned that this particular chogori is a fine example of Korean culture. I do not know if this chogori is factory made, or lovingly made by an unknown mother, but it is extremely well made with the utmost respect to Korean culture, color, and design. One cannot help but notice the color and detail of the fabric. A fine silk floral embroidery graces the right elbow of the jacket by design. The five elemental colors on each sleeve are bright, not faded. Tammy's underskirts are made of fabrics typical of the Korean chima worn in a formal setting. The gold brocade print on the bottom of the magenta chima is consistent with what is worn for Korean dance or celebration. The magenta chima fastens with a tie, and can be tied in the front or back. The peach colored chima is also a true Korean wrap style skirt, and fastens with one snap. This particular item caught my eye not because of its color or condition, but because it came to me tagged. The above picture of the typed "Young Chin Girls' Vocational Training Center (Orphans) Seoul, Korea (Compassion) paper was taped to the outside of the dress. It is my guess that this underskirt/dress was tagged on the front because it was once a handwork worthy of proud display, or worthy of being sold at the local gift shop to help with funding the vocational center. Honesty is my best policy. This is one of my favorite Tammy rescues, and my first Pos'n Tammy doll. 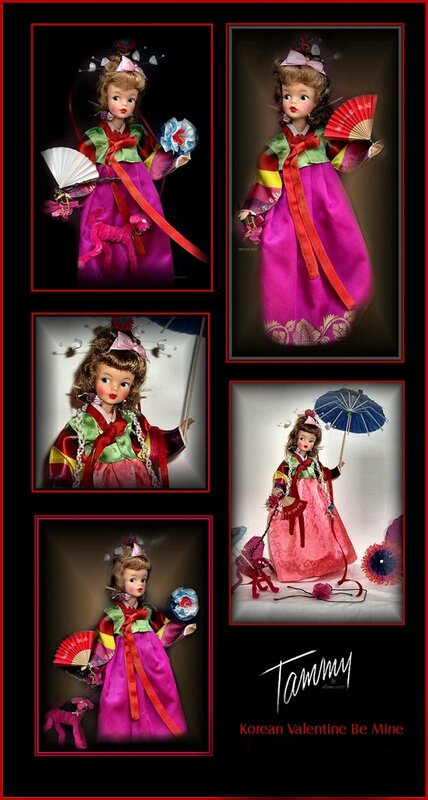 The Pos'n Tammy doll modeling the Korean Hanbok was made by Ideal Toy Company between 1962-1966. The Ideal Tammy doll is a continual learning experience with me, and I am sure it with other Friends Of Tammy, too. The special articles of Korean clothing came to me over the course of the past ten years, and were not near each other in storage. I did not know these items were meant to go together until I pulled them for their colorful Asian look. Magically, each item fit Tammy as though they were made for her. Many thanks to the web sites above for sharing their information, and for all who posted their pictures on the internet. Learning something new is a wonderful thing to do. History, culture, and tradition are often recorded through means of a doll and its costume, and often the dolls and their clothes have a story to tell. The mystery of Tammy's hanbok does not end here. 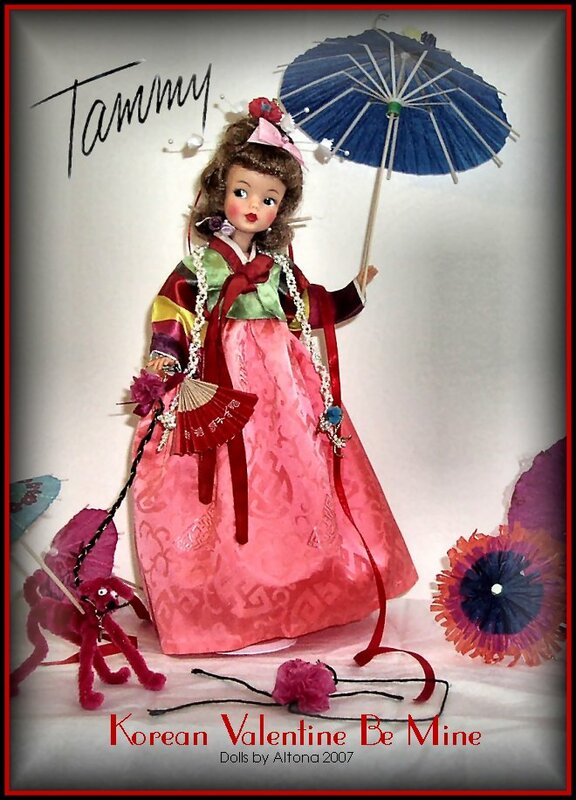 Did Ideal Toy Company made a Tammy doll in Korea or for Korea in the 1960s? Were Korean issued clothes issued for the dolls? What about the origin of each piece of Tammy's Korean outfit? What is the history of the Young Chin Girls' Vocational Training Center? The mystery continues. Also, many thanks to all the sweethearts associated with Orphans Compassion, and those affiliated with The Young Chin Girls Vocational Training Center of Seoul, Korea involved in making the lovely peach chima. By identifying your work with a tag, you helped me share its design and origin. Looking for something special? Inquiries Welcome. New! 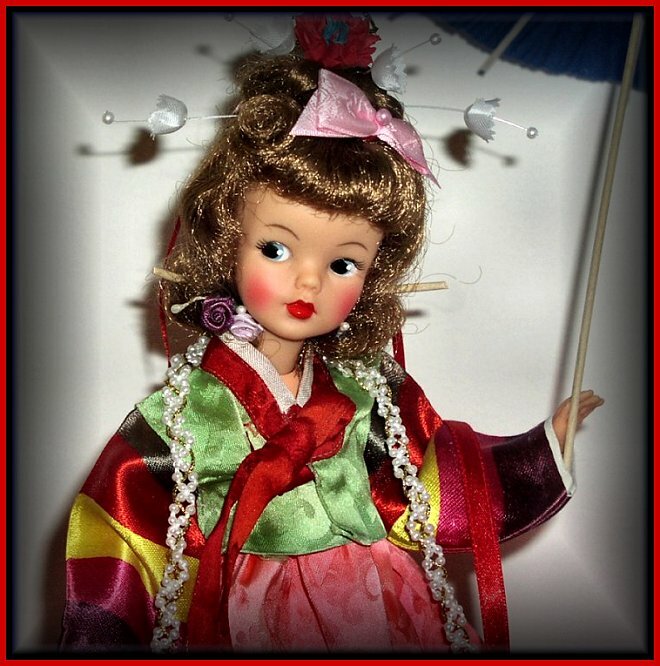 Dolls by Altona Guestbook on Squidoo - New! All photographs, copy, artwork, and web elements are the sole property of Dolls by Altona. 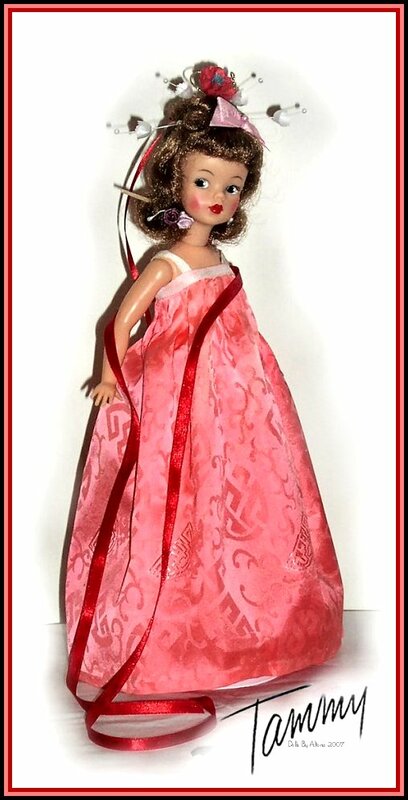 Copyright ©2007 Dolls by Altona - All Rights Reserved.